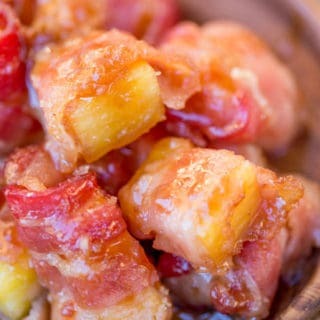 Spicy Sweet Bacon Wrapped Pineapple Bites caramelized with brown sugar and hot sauce make a perfect sticky, sweet, spicy, fruity bacon bite your guest will love in just minutes! Cut bacon in half and wrap each strip around a piece of pineapple. Roll in the brown sugar, packing on the sugar onto the ends. If you want to help avoid a mess in the pan from the brown sugar line the pan with foil. Bake for 18-20 minutes or until the bacon is crisp and the brown sugar is all bubbly.